The information presented on this page was originally released on November 3, 2014. It may not be outdated, but please search our site for more current information. If you plan to quote or reference this information in a publication, please check with the Extension specialist or author before proceeding. MISSISSIPPI STATE -- A Mississippi State University professor emeritus recently received a national honor for his lifetime of service. 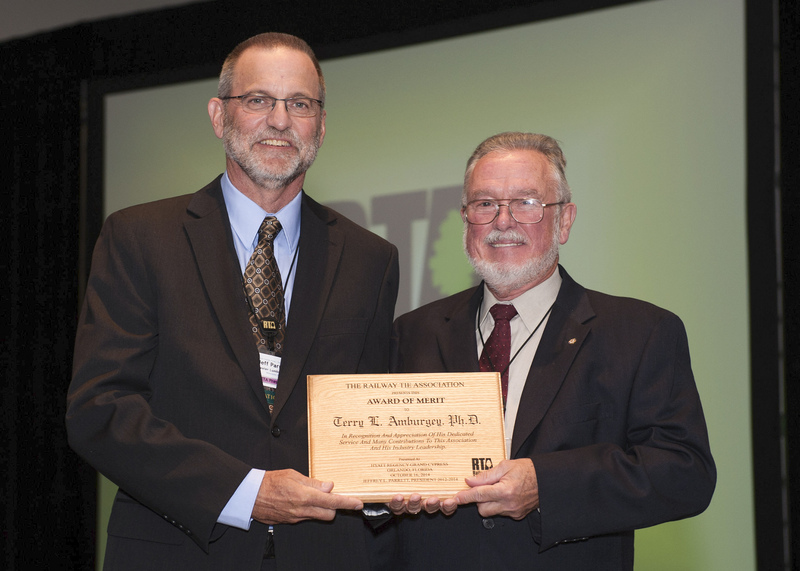 The Railway Tie Association, or RTA, executive committee gave Terry Amburgey, a Giles Distinguished Professor, the 2014 Award of Merit for his contribution to the industry. The award is given at the executive committee’s discretion and has been awarded only two other times since the association was formed in 1919. Amburgey’s career in wood protection spans 50 years. His research has contributed to improvements within the railway tie industry and beyond. Amburgey helped increase the lifespan of railway crossties from eight to 15 years to more than 25 years. At the onset of his research in the early 1980s, he observed that crossties were vulnerable to fungi and insect damage even during the production phase. Amburgey discovered that treating crossties with borates during the air drying process protected the wood from pests. Rubin Shmulsky, head of MSU’s Department of Sustainable Bioproducts, said Amburgey is an innovator in the wood protection field. Amburgey served as a professor in the MSU College of Forest Resources for more than 30 years. He earned his bachelor’s and master’s degrees at State University of New York College of Environmental Science and Forestry and his doctoral degree at North Carolina State University. For more about the Department of Sustainable Bioproducts in the MSU College of Forest Resources, visit http://www.cfr.msstate.edu/forestp.